This was a splendiferous day. The children were definitely excited about coming back, and all the teachers managed to stay awake - with the help of coffee and Skittles. As I was preparing for the first night of the seminar on Wednesday, I felt that the Lord was asking me to make a request. In Matthew 6:28, Peter says, "Lord...bid me come unto thee on the water." The Lord did not call to Peter to walk on water until Peter asked. Normally, I am a "safe" person, who does not like to take great risks, but I felt like God was asking me to ask for something stunning, dangerous, and impossible. I had never led anyone to the Lord before, and was slowly drawn towards asking that this week I would be able to lead one child to the Lord. I could think of many obstacles and reasons to be afraid, but God met and answered each one until I agreed to ask. Today, as I got up, I knew that this was my last chance. This was the last day of the last seminar, perhaps the last CI I'll ever teach. The morning went well, and I was able to talk to one girl about salvation, but didn't get anywhere before lunch. I didn't know which child to talk to or pray for specifically, and I was getting stressed. Then, after lunch, it just so happened that I was alone with an 11-year-old girl who spoke good English. After going through the Romans Road, which I had practiced just a couple hours before, Rebecca prayed to accept the gift of salvation. God answers prayer! After the seminar and our final cool down ended, we all headed over to the Ladies Market to get rid of the last of our Hong Kong dollars and seminar stress. We may have set a new Guinness World Record, too: we crammed 12 people into one sticker picture machine. The trip is almost over, but it has been wonderful. God is faithful, and God is good. It didn't shake us that it was a rainy, dreary sort of day. It didn't shake us that we had to move to a different dormitory after only being in Hong Kong for three days. It didn't shake us that lunch was served in Tupperware. It didn't shake us that some of us are sick or having inexplicable allergic reactions. It didn't shake us that the microphones went crazy right when the story started. It didn't shake us that there were issues to work through with some of the parents. It didn't shake us that things went wrong or that the kids in the back couldn't hear. None of this mattered because our confidence lies not in our circumstances, but in promise of certain victory from our God! I love this passage of Scripture and how Caleb spoke with rock-solid confidence and faith. He knew that what God had promised (forty five years before) when he had obediently and faithfully went to Kadesh-barnea to spy out the land was true. God would give him this mountain. This is what made Caleb different from his peers and the other men of Israel. Caleb had faith and vision that nothing... no obstacle, no emotion, no fear, no enemy, no challenge could shake. He saw what other men could not see because He believed God and wholly followed Him. Tim reminded us this morning in devotions that Hong Kong is another peak on our mountain. This is the mountain we know we will win. We know God is Victor. We know Satan is defeated, and our desire and prayer is to be able to see and walk in that victory. We asked God for eyes that looked beyond what we could physically see: the lights, the buildings and the concrete. We asked for the ability to see the whole island of Hong Kong through the eyes of God and to be able to see souls rather than masses of people. We asked God for more than just a successful week at the CI and Basic Seminar, we asked Him to use our team this week to make an impact that will last not just for the duration of our trip, but that will touch Hong Kong and continue into China for many generations. I believe with all my heart that God will honor those prayers because of the faith of His people. After devotions today we moved into "Happy Acres" (uh...I mean, Breakthrough Youth Village), because Fok Ying Tung Hall (our original lodging) was only available for the first few days of our stay here. Despite the inconvenience of a mid-week move, I think we're all enjoying the zany family style accommodations after a month of hotel rooms. Our second seminar day here in Hong Kong went well. The International Christian Quality Music School with it's beautiful amphitheater, concert halls and flowered overhangs once again hosts our staff and over 400 Basic Seminar attendees along with 155+ children. We are confident that our God is working here! Sure, there are challenges and there are obstacles, but we believe God and are wholly following Him. We know that just as He was faithful to Caleb, He is faithful to us and will complete His work here. We know that your faithful prayers and support are a huge contribution to the ministry here. Thanks for sharing with us in what God is doing in Taiwan and Hong Kong! What Happens at a CI? Have you ever wondered what goes on in a CI? Or what do we do on these trips? Well, it is not always fun or exciting as some people say, but it is a life changing experience. It is Wednesday, the 21st, and that means its the first day for the CI in Hong Kong. Now the first day is not very easy. You don't know what kids you will have on your team or whether they are good or "bad." You do not know what challenges or struggles you will face. You just pray and hope that God will give you good children on your team. Well, it was 6:00PM and children started to come in to my team. I was a little nervous as I said, "Hello." I thought to myself, I shouldn't be nervous it is only my 4th CI this trip. So, as the night went on I got to know my kids better. I knew who the good kids were and who were not so good. As I taught my first lesson, it seemed like they were listening and starting to get it. But only God knows what they learn and understand during my lesson. And so the night went on and it seemed like it would never end. I thought that Shannon’s and my lessons went well, but I didn't see God move incredibly. I heard some one say this once, though, and it really spoke to me: "There is no doubt that God will work in the children's lives, but we must not miss Him when he is working." Well, what is all I have to say and hope this will help you look at things differently. So, continue to pray for us and God bless! Welcome to the thriving metropolis of Hong Kong! Now a bus ride up a winding mountain road overlooking the East China Sea sounds amazing, and it was, but looking just outside the window was a sight that had some of us closing our eyes and holding on for dear life. To our left was a rock wall, to our right was a sheer cliff and in between those two obstacles was the narrowest road I have ever seen! We twisted our way around blind curves with other large buses there to meet us at high speeds on their way down the mountain, missing each other by the slightest of margins. This is where riding in a bus is a whole new experience. This excursion led us safely to our destination, a small tourist town named Stanley Market. It had shops, a beach, and the most expensive ice cream known to man. We spent our time eating, shopping, haggling, finding the well hidden bathroom, riding the escalators just for fun, and enjoying the view. After a fun-filled afternoon we took the bus (along with the same experienced bus driver) across the city and up another mountain to a mall in the sky, where the altitude reflected the prices. It was very cloudy up there so we could only see about 100 yards away and after some shopping and a quick dinner on the roof of the mall we got in line for the trolley ride down the mountain. And let me tell you the ride was worth the 2 hour wait in line! There were not enough seats in the trolley so some of us had to stand. Imagine standing on an airplane that's descending toward the ground very rapidly, and that is about how it felt. When you looked out the window, buildings looked like the leaning tower of Piza will in a few decades. Once we got back on solid ground our bus driver was there to greet us with his confident reassuring attitude, and so we were on our way back to the hotel to get some much need rest and also to prepare for the first day of the seminar tomorrow. Thank you all so much for your prayers and support, I'm excited to see what God will do in this mostly unreached city of Hong Kong. After a fun filled day of amazing sports, we went to celebrate the Chinese New Year at the IBLP office. We had an enjoyable time eatting the New Year's food. All of the meat and vegtables were cooked in a pot , somthing like a crock pot. And after it was cooked we ate it with our sauce and rice. After singing a couple songs, we had a sharing time, which was very exciting. Many testimonies were given. Some about God working in their lives and hearts in the trip, God giving them purpose for being in the trip, and how God has used different things to teach us. It's amazing to think back on these past few weeks to see how God has worked in each and every life. I am looking forward to seeing Him work during the rest of the trip. I have realized that though we came to minister to others, we in turn have been ministered to more. With each situation, God has been faithful and taught us how to overcome it. And with His grace we have. God has worked in our lives and taught us new and exciting things. Things which we won't soon forget. Wow, time is flying past! We have already finished our third seminar of the trip. Usually the last day of a seminar is a full day from morning until evening, but today we started just at 1pm and went until night time which allowed us to sleep in a little later today than usual. After rousing ourselves, we ate breakfast and had wisdom search. During wisdom search we had a discussion on sanctification which was really interesting and eye opening to me. Eventually we headed over to the church for the seminar. This week has been full of blessings for me. 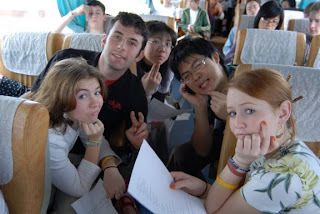 I had great kids who were relatively obedient and two incredible translators to work with. My lessons seemed to go pretty smoothly this week, but even so, I still had a doubt in my mind as to whether my kids were really getting it or really understanding the lessons. So often I tend to focus on myself and my goals instead of God and what His goals and what He's accomplishing. Throughout the week God has been really working in my life in the area of faith and trust. Trusting Him with my future, with the kids I'm teaching, and in many other areas. He's been teaching me the importance of having to faith to let go and let God work in my life and the lives of the children. It's so much easier to talk about it than to actually live it out in my life. This week God showed me that He is working in the lives of these children and teaching them in spite of my blindness. I was really encouraged, yet also ashamed at my own doubt, when yesterday two parents of my students came up to me and shared with me things that showed me that the children really were learning and God was really working in their lives. One parent shared that her children loved the seminar last year and that there attitudes towards each other were changed in a major way after the seminar. Because of this change she promised them they could come again this year even though she was really busy and couldn't make it to the seminar herself. God really is doing amazing things, I just need to trust Him and open up my eyes so I don't miss what He's doing! 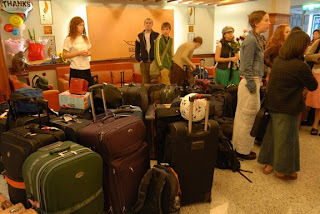 When the seminar finished we said goodbye to our students and packed up our stuff. Then it came time to say goodbye to many of the translators. Soon we headed over to Shilin night market where we shopped, ate, and more. To finish off the night, Edie, Igloo, Karen, and I decided to get sticker pictures made which took so long that we had to make a mad dash to the MRT and barely made it... yes, it was a blast!!! Finally we headed back to the hotel where we said goodbye to many awesome staff people and translators that we had become close friends with during the past few weeks. I am really blessed to know them and so glad that God brought them into my life!!!! Thank you so much for praying for us, it's a great encouragement to me and the team and it's amazing to see how God is answering!!! I can't wait to see what God has in store for our last seminar in Hong Kong!! I aimlessly meandered down the hall this morning, mindlessly contemplating an earlier breakfast and my purpose in life. The first big decision of the day then faced me. I stood staring at those huge metal doors and wondered, "To take the elevator, or not to take the elevator?" Choosing the former, I clambered in and was met with two familiar thoughts. "I wonder what it would be like to free fall in one of these boxes? I wonder if I will now have the joy of finding out?" However, remembering our lesson for tomorrow night, I quickly took those thoughts captive, contemplated their basis on truth for a few moments, and as the elevator doors opened to the lobby, dismissed them as completely unfounded. I met up with my team, as well as the one that likes to follow us, there in the lobby. After a few moments of tired, yet edifying conversation, we set out to meet the day. Immediately upon exiting the hotel, my senses were bombarded with the strange and exciting world around me. Mopeds wizzed by, the smell of stinking tofu filled the air, bright colors and signs met the eye at every turn, and the laughter of CI teachers could be heard in every ear. What a beautiful morning! 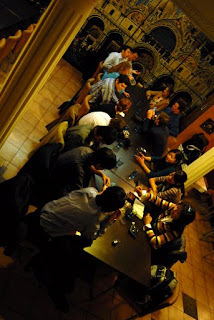 We soon arrived at a quaint little Italian restaurant and descended to its basement. The atmosphere was perfect! Picrtures of Venice, soft music, marble columns . . . aaahhh. Jeffrey then shared with us, encouraging us not to be distracted by the world around us, but rather to listen for God's still small voice in our lives. For like with Elijah, God is not in the wind, the earthquake, or the fire. Instead, He comes to us quietly. It seemed so ironic, yet so perfect, after the bombardment of just moments before. How often I get caught up in the amazing things that God is doing all around me that I miss God Himself! As the seminar began again tonight, I was faced with a new set of challenges. My kids this week do not hang breathlessly on my every word. They are not angelic, at times, not even attentive. But they are lovable and cry out for love. My lessons were not perfect, and sometimes frustrating, but the Lord was with me, reminiding me in that still small voice, to love. The evening ended and we boarded the MRT for our short ride to the hotel. Thinking back, I was reminded of the truths I learned earlier in the day. 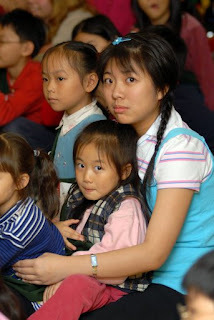 I have not found God in the wonders of Taiwan, attentive kids, or "perfect" lesson plans. Rather, in His love, He has chosen to speak to me as a still, small voice. And as I seek Him, I find Him there. At times, even in the elevator. Well, to start off this wonderful day. We stuffed ourselves on Friends Hotel's wonderful breakfast. Then, at 10 o'clock or sometime around there, we gathered in the business center for devotions. Luke started off devotions with a couple special music selections on his guitar, specially selected for Valentines day, of course. After which Karen did an awesome Valentine’s Day devotion. We were joined today by a group of young people known as the 'Joshua Homeschoolers.' 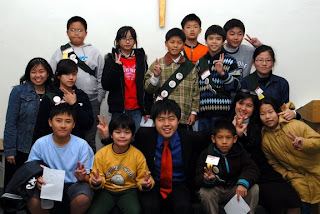 They are a group of homeschoolers who are pioneering homeschooling for Taiwan. So anyway, after devotions we went on a excursion into downtown Taipei to visit the Chang Kai Shek Memorial. We took pictures, walked through the museum, played catch with a football, and watched the changing of the guard. Watching the guard change was really neat, they do a small drill ceremony while switching and then the new guards stand perfectly still for a hour or two until they are replaced. After spending a couple hours at the memorial, we went to a souvenir shop. It had a lot of neat little things and it was a lot of fun looking around and trying to decide what to get, but never fear, there was always half a dozen to a dozen people more than willing to part with they're opinion. That's what made it fun. It was really awesome getting to know the Joshua students. They were between 10 and 16 years old, and it was neat to talk to them and share with them about our common experiences with homeschooling. This afternoon was a blast! Sometime around 5 o'clock we headed back to the hotel to get ready for the CI tonight. The CI is going awesome this week. 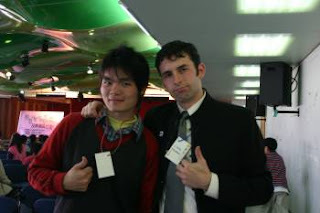 I have two awesome assistants from Taiwan, Joy and Toby, they're so good, I am a very unnecessary member of the team. The kids here at Taipei are great too. It is awesome to see God working in the lives of these kids. One of the things I am learning this week is that I often underestimate what God want to do, consequently I often ask only for little favors when God really wants to do so much more. I am learning to visualize just how much He wants to do and to ask Him for the impossible. Anyway, this has been an awesome Valentine day. It’s amazing to see how God is working in the lives of these kids. Thank you everyone for your prayers, You are making an awesome difference! Continue to pray that the words of our mouth and the meditations of our heart would be acceptable and pleasing to the Lord. As I woke up in the morning, I managed to get up and adjust my mindset. Yes, I was in Taipei, and this would be my last week of the CI trip. So there the day began. We had wisdom search in the morning and we went to a beef noodles place for lunch. Yum! We met Hannah’s parents at the restaurant. Finally I got to meet them after I have been befriending one of their wonderful daughters for more than two years! After being staff for two weeks, I knew that I was going to be a team leader this week. I have to admit that it wasn’t easy for me since I hadn’t been teaching kids for a while. However, even though I felt unprepared, God had prepared everything I needed. He even provided me with two of the most awesome assistants—Juliana and Jordan! I knew that it would be a fun week being with them and with the kids, but the hardship of transitioning my mindset was still going to be my struggle. Anyhow, I found myself in the battle field when the first kid arrived. Indeed it wasn’t a super good day for me, since I was having a hard time adjusting myself to the new role as a team leader for the first time. Looking back on the first day of teaching among the whole week, I realized that the difficulties and the frustrations I experienced at first were to prepare me for the rest of the week. That night in the lessons, just like how I taught the kids about the character of humility, God was teaching me the same lesson, as well. It was right then that I found myself lacking of the patience, the love, and the enthusiasm required of a teacher. As I saw my shortcomings, God reminded me that I should depend on Him totally. Ever since then, God just let me make it through the week victoriously. Starting from the next day, I re-discovered my love toward the kids, and my long-lost teaching groove. I could proudly say that God made my last week filled with joy and victory! I always thought that I should have fulfilled the requirement of the training of being a team leader earlier on the trip. However, as I’m writing this right now, I’m really thankful that God made this arrangement because He led me back to the very basic of the CI ministry in the last week: it’s not just about the funny stories, it’s not just about the cultural exchanges, it’s not just about the cool things I’ve been experiencing in the past years. Instead, it’s about ministering to and serving the children, and, ultimately, it’s about serving the Lord. On the team working with my kids, I could understand where they are right now more, and I could impact them more deeply. There I reviewed the reason why I came for the first time, before I knew those other cool stuff about this ministry. I extremely thank God for letting me cherish my last week in this firstly considered not-so-cherish-able way. I know I’m not any better than anyone else, but I’ll just be His instrument, waiting for Him to work through me. This is the last day we stayed in Kaoshuing. That is right, we are leaving today!! After loading the mountains of luggage and saying goodbye to this beautiful and lovely city, we started our long journey by bus, from Kaoshuing to Taipei. On the way, we were really, really tired and slept almost the whole morning trying to get as much rest as we can since we have to start the Taipei seminar tomorrow. We also had the McDonald’s as our delicious lunch in the bus. Delicious food, good fellowship, and long sleep, made the bus journey so perfect!! We got to Taipei about 4 or 5 o’clock in the afternoon, we had a simple worship time and a wisdom search with sharing for the Sunday service. During the worship time, I felt that God was showing His love to us, those He created and loves. Besides this is the day to take some rest, this is also the birthday of our dear lovely friend Miss Karen. We sang the song number “31” on the song sheet to Karen, the Happy Birthday song! To celebrate Karen’s birthday, we went to a Vietnamese restaurant, one of Karen’s favorite restaurants, and had a great and delicious meal. We had some shrimp rolls, fried rice, sour chicken, etc. A special dinner for our special Karen and us! Then there was our “shopping and fun time” again. We had an hour to relax our body and spirit. While I was looking at thousands of things for sale on the streets, God also gave me a chance to see those people with His eyes. He showed me how much these people need our Heavenly Father, our hope and joy, the Lord who meet our every need on the single day. I think that is why we are here, for the children, adults, and the whole families. May God bless the seminar and our work, to glorify and honor His name, here in Taiwan, and every place in the world. I love this city. I love the lights across the Love River, the beautiful harbor, the awesome translators, the crowded night markets, the hair salons, the Outdoor Cafe and a very small part of me even likes the infamous Monkey Mountain. I love the seminar here. I love coming back and seeing the kids that I've gotten to know in past years. I love how they run up to me: "Ka Ting Jia, Ka Ting Jia...." (Big Sister Kristi) and then they ramble off in Chinese remembering jokes that I've told year after year because they all that I know how to say in Chinese. I love that they remember and it delights my heart to see the smiles in their eyes. 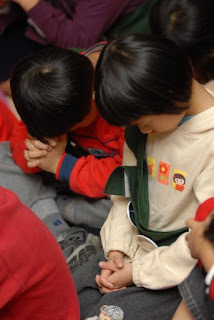 I love watching them bow their heads and pray in a language I can’t understand, but know that God hears. I love seeing them climb all over their teachers and revel in the attention they give them. I love watching the teachers hold them on their laps during large group, I love seeing them laughing with all their hearts when something funny happens. I love how they run up to their parents eagerly showing them the crafts they made and telling them about the lessons and stories. I love watching young people who are wholly committed to God persevere through each challenge, no matter how difficult, even when they're sick. As I stood at the door and waved goodbye to the children as they left each night, I realized that it’s all of these things that make up the ministry of the Children’s Institute. It’s what draws many of us back year after year. It’s the joy of helping these children to love the Lord their God with all their hearts, their minds, their souls and strength. Pray for the seeds that were sown in the hearts of 183 children this week. May they fall on ground prepared by the Holy Spirit and grow strong and produce fruit that will last for generations. Pray for the friends we made this week who have not yet chosen to follow Christ. Pray for our interpreters. 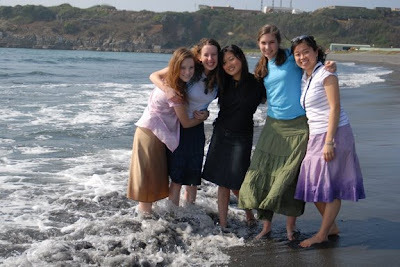 They live here and daily have chances to reach Kaohsiung with the hope of Jesus Christ. May they be encouraged in their faith because of the ways we have seen God work. I can’t wait to see what God’s going to do next! Kaohsiung—the city of balmy weather and great CI kids. In past years, Kaohsiung has often carried the title of “easiest CI” because of its generally quiet, well-behaved participants. 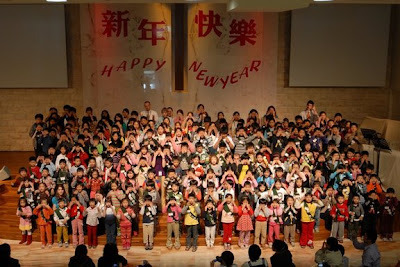 This year also boasted “180 of Kaohsiung’s best children,” but from the first evening, I knew it would be different. This group was loud, enthusiastic, and excited to be here (for the most part!). Although the first large group was a bit rowdy, I loved watching the excitement on their faces as they laughed at Kristi’s yet again mistimed Zhao An!, as they popped the balloon in “The Balloon Song,” and as they screamed their encouragement at the funny camel on stage. It reminded me of why I love working with these little people. They wear no masks and fake nothing; if something is boring, don’t expect to keep their attention! On the other hand, truth reaches their open hearts so easily. One of my favorite memories of that week happened during the story where someone’s spanking is taken by his friend. A gasp went through the room, and it was a moment where I could visualize lights going on in their heads, that Jesus did that for them! No wonder Jesus said we must have faith and innocence like little children to enter the kingdom of heaven. Realizing that I am nothing and have nothing, therefore everything in life is a gift from God. Over the past week and a half, it's been so amazing to realize that we really are nothing. But, praise GOD - He is everything! Today, after a lovely lunch at The Outdoor Café, we made our way (by bus) to the base of Monkey Mountain, and began the long, sluggish trek up. The views from the top were definitely worth the time, and effort it took to get up there. We were definitely surprised to see very few monkeys during the hike, and at the peak, even. A team mate and I were discussing a few days ago, that it is so amazing to see the cities, and countryside here and to realize that there are mountains, and massive cities on the other side of the world, that we knew nothing about. We made it back to the hotel with small amounts of time to spare in getting prepared (and thoroughly showered) for the seminar tonight. The focus of tonight's lesson was "taking thoughts captive." It amazes me, every seminar how on this particular evening the spiritual warfare increases in dramatic ways. On the flip side, God is increasingly gracious during the small and large groups. God reminded us all in some way "This is My Children's Institute. These are my precious children… And I will be the victor in the battle for their hearts. Humble yourself before Me, and allow My words and spirit to fill you, because You are nothing without Me." I love seeing the sleepy smiles on my team mates faces after the night is over, and hearing about their struggles, and sharing their victories through Christ. We ourselves cannot be victorious, but through Christ and His everlasting power. As we walk back to our beautiful hotel, sharing the events of the evening, many of us voice our disbelief at "surviving" another night. It thrills my heart to see the power of God in the life of each dear friend here – and to see Him giving each the strength they need to not only survive another evening, but to walk away praising Him for the wonders that He has done, and will continue to do during the seminar here in Kaohsiung. I love each member of this team, and the beauty of Christ in them, our weaknesses and how it all works together to create a strong, and powerful representation of Him. Half of the team was sick. Some lost their voice. Some coughed really hard. God gave us some very special kids with very special needs. Plus, we broke two iron chairs that belonged to our nice facility. It seemed that our week in Kaohsiung was going to be tough. Nevertheless, we had been learning the power of prayer. Even though no one is perfect, but the team is united and perfected through one another's prayer intercession. We fixed our eyes on God, and our weaknesses became the spots where the Lord showed His strength and might. And this is victory. Today has gone well. Without the investments that all the teachers and assistants made, kids would not be able to pull out points from the lessons they heard; without everyone's supports and prayers, none of the lessons could be carried on smoothly. Also, many children started to opened their hearts to the teachers. It was all because God works in their hearts, these kids were energetic and obedient. Some teachers are preparing themselves to be team leaders this week. 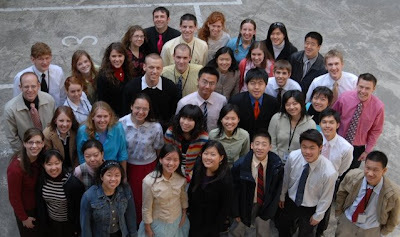 For next week in Taipei, each American student will have to lead a team with probably only one interpreter. Some leaders from last week became assistants just for others to take turns to practice. It wasn't very easy. However, humility and ministry spirit were found in the harmony of this team. And it is our privilege to be allowed to work with God through submission and prayer. Thank you so much for your prayers! Let us praise the Lord for what He has done through this team! It is amazing what the Lord will teach you when you are just willing to grow and allow the Lord to stretch you. One of the things that has been a recurring theme for me on this trip is the fact that we could probably do everything we are doing without God. But oh, how much better it is when we acknowledge Him in every aspect of our life. We could just accept the problems and wait for things to improve, which I often find myself doing. But instead, in each and every obstacle we encounter, we should take it to the Lord. In doing this, each success would be a praise to Him, to His glory. In this CI team, I have been really encouraged to pray about even the “little” problems that I encounter. Satan wants to take us down by distracting us first with the little things. But as we bring every situation before the throne of God, Satan is defeated, and our victory in Christ is actively known, and Christ Jesus gets all the glory. 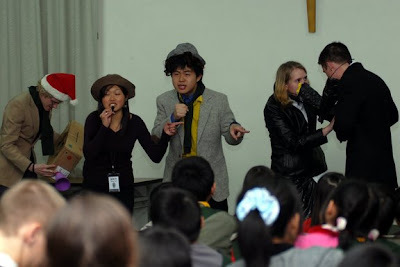 Six of us were invited to Tainan today to teach at a one-day Character Conference for families. Tim and Dr. Chen were in charge, and as usual, we were unable to devise a plan because we did not know what factors we would have to deal with until we arrived. He, myself, Naomi, Charity, and Angel were responsible for the majority of the teaching with the elementary and high school students from 10AM to 4PM. We each had Taiwanese helpers from a local school. It was cool to get to know them. Despite all Tim’s concerns, we completed a schedule and mostly followed it. A teaching expert from Tauyen was also present and led some educational group activities. We created an all-new CI style story/skit about tracing surface problems to root causes. I gave a testimony to all the families, which was translated by Dr. Chen. When it was time to leave, all the students mobbed us, asking for pictures. It was pretty cool because most of them did not even have English names! Later we partied at the Europe Pie Shoppe, laughing like maniacs at Tim’s fairy tale stories. You should ask him to tell them to you sometime. Six members of our team (Dad, Tim, Naomi, Luke, Angel, and Charity) left early yesterday morning to serve a group of people in Tainan. We kept them in prayer throughout the day and were happy to hear that they were champions in the endeavor! Wes led a great (and fun!) wisdom search about the Sword of the Spirit, which is the Word of God. We played a game of Bible Trivia, but unfortunately, none of us were able to claim the prize of a free Starbucks by getting all the answers right. Do you know what was fastened to the Philistine’s temple of Dagon? or the name of the sorcerer that withstood Barnabas and Paul? We were challenged to love God’s Word more and dig into it deeper in order to use it effectively in spiritual warfare. After having lunch at one of my favorite food courts, the Hosanna Bus brought us to the ferry dock. We followed moped riders onto the ferry and enjoyed a quick ride over to Qijing. The sun was shining and the weather was beautiful. We had free time for the next three hours. Some played football on the beach while others ran down the shore, got their feet wet in the Pacific, collected shells, and/or perused the shops in the area. Rebecca and I scouted out a restaurant for dinner and negotiated a menu and price. Dinner at a seafood restaurant that evening was the first round table/lazy Susan meal for our group. Highlights of the meal included Chad kissing a shrimp, Doug dissecting his food, Truth or Dare with Rachel and clams, and Kristi’s obsession with Sebastian. Having our stomachs filled with such delicacies, we took the ferry back over to Kaohsiung. It was breathtaking at night—I think we all wished it could’ve lasted a little longer. We topped off the evening with the best strawberry shaved ice of all time. Many people made sure to leave their mark by writing on the walls and carving their names in the tables. Everyone got to experience another aspect of the Taiwan culture by taking yellow taxis back to our hotel. Yes indeed—it was a day of delicious food, enriching fellowship, and loads of fun. J’adore Qijing! On Saturday we neded to be at our CI team station earlier than we’ve been getting out of bed most days. But somehow we made it there. 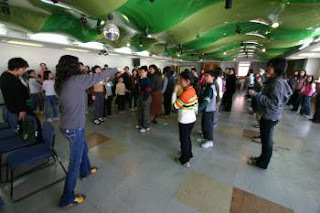 In the first large group, I helped demonstrate wake-up exercises for everyone. I taught them some face-wiggling moves to wake up their faces. As the kids were all leaving for the last time, I noticed one of my boys drawing in an art-book with some text written in it as well. It turned out that he was writing and illustrating his own book about a man contemplating suicide, but then turns his life around when he finds a Bible. I thought that was awesome. For supper, my Bible study group, led by Jeff, was going to join up with Ben’s and go to a cool Japanese Steakhouse. But the wait for a party of 18 was over an hour. So instead we both walked away, then our team doubled back and went there anyway. Good stuff! 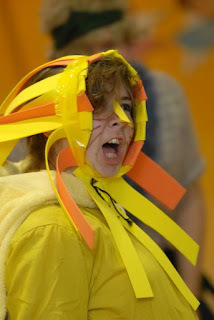 When I watch people acting in the skits on stage, I am proud of how they wholeheartedly put themselves into the story. 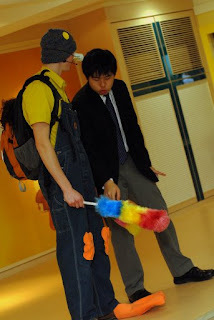 The actors really get into character in order to touch the children and clearly communicate the story’s message. I know that God can use such dedicated teachers. I also see God working in my small group. In my group, there are two older boys who are naughty. We pray for them everyday and I have found that they are changing little by little. I do believe they will remember and apply what they learned this week in the future. As we plant seeds in their minds, God can cause those seeds to grow up! It means obeying God, even when I don’t understand and it’s hard. As we taught our Responsibility Lesson tonight, that 3rd point became very clear. Each of the twelve children on my team and myself, who have given their lives to Christ, are not our own, but were bought with a price. We can’t let Satan shoot his “darts” and lies at us, we must stand strong in God’s strength and armor. We also talked about the Helmet of Salvation tonight. The helmet is Christ who protects us from the power of sin. Because my mind is Christ’s, He gives me the power to keep it pure and “flying the flag” of righteousness.